Following a bubbling spring, we scrambled and bouldered down loose rocks and past big horned sheep on cliff faces to the valley floor. From the base, I looked up from where we came and out to where we had yet to go. It looked daunting. My legs were tired from hiking all weekend and running the Rocky Mountain Half Marathon the day before, but it was my first 14er. Turning around wasn’t an option. After our exciting descent from where we parked the car along the highway, we made our way across the valley floor in the pre-sunrise glow. 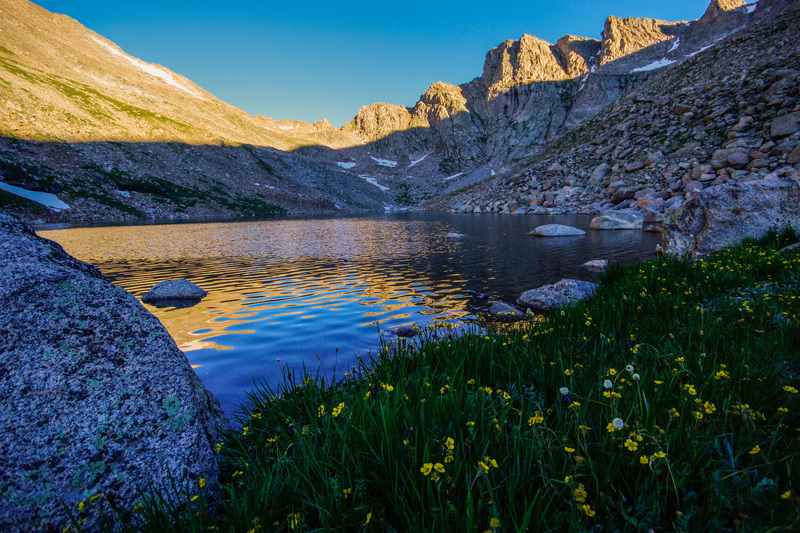 The chill of the alpine air clung to my jacket and fingers as we stood on the south side of Summit Lake. Both Bierstadt and Mt. Evans rose before us, the sawtooth ridge straddling our trail. 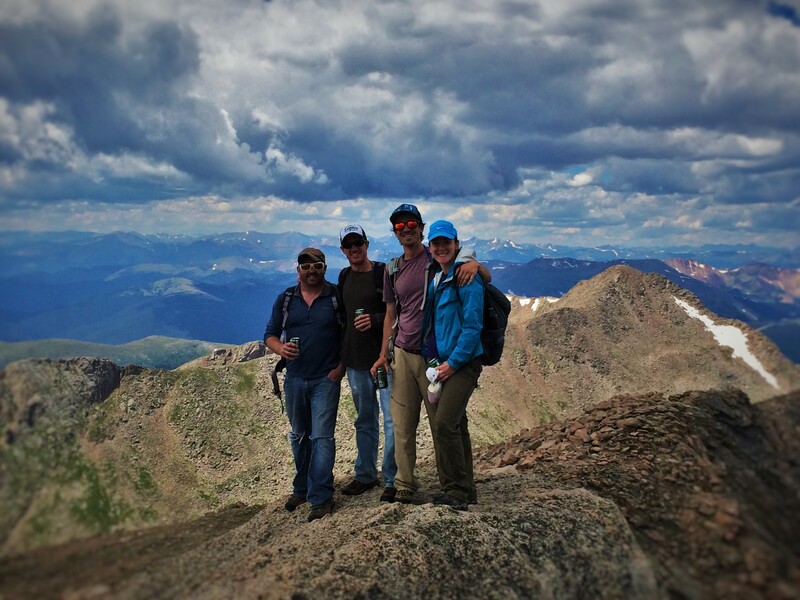 The plan was to go for both 14ers in one day – a hiking double-whammy. With a warm cup of coffee and cliff bar in our stomachs for energy, we set out over the Volkswagen sized boulder feild; but quickly I started to fall behind my group. Those pounding-pavement miles and four hours of tent sleep trailing my every step. 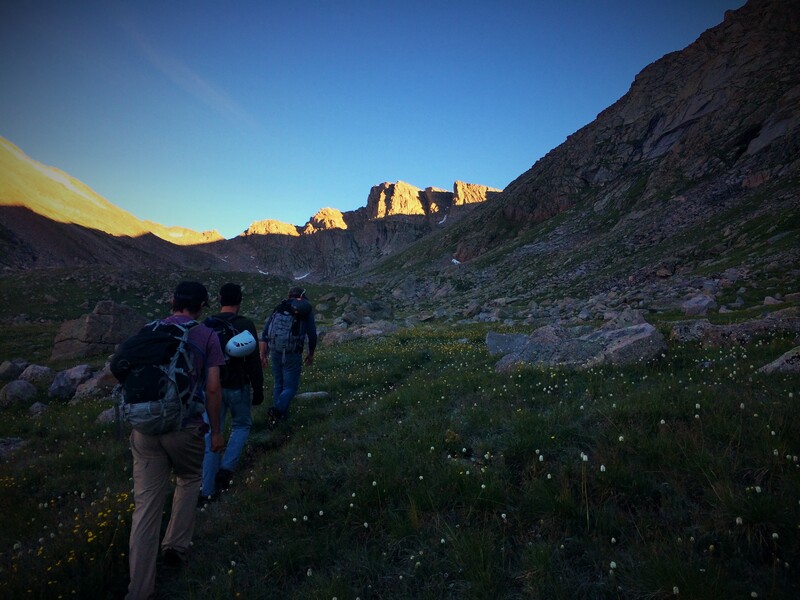 By half way up to the sawtooth ridge, I knew I wouldn’t make both peaks in our intended finish time so I sent the boys on ahead to summit Bierstadt as I made my way slowly to the mid-point along the ridge where they’d have to converge before setting out to Mt. Evans. 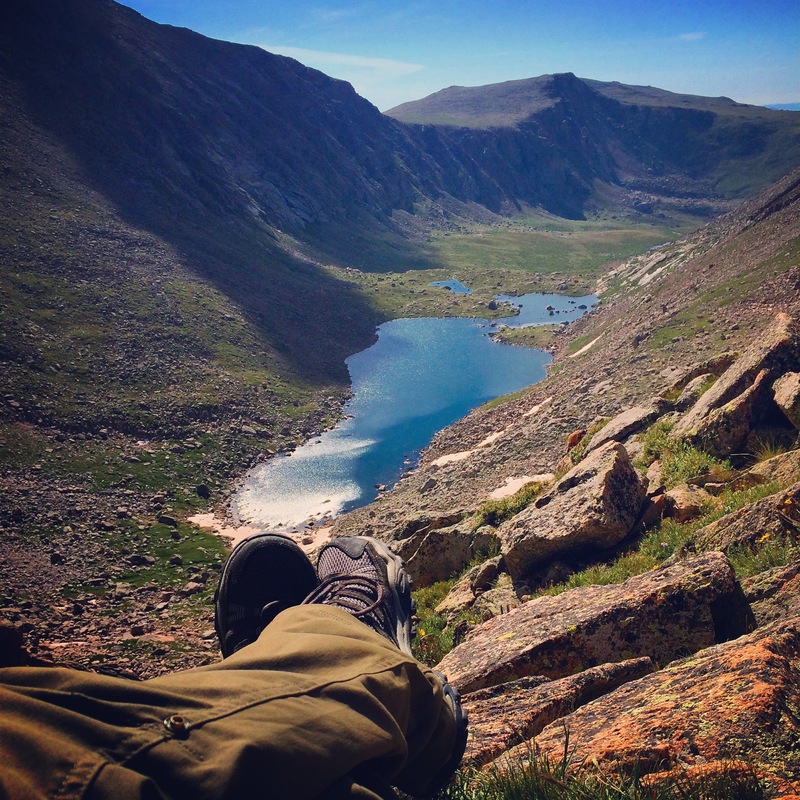 Laying in the sun, stretched out, and eating my favorite trail snack (gummy bears), I savored the sweetness of the late summer, the Colorado wilderness, and that instant muscle relief of sitting on my rump. The view couldn’t be better. Yet, I still closed my eyes for a few minutes. But before long, my boyfriend and his friends were back by my side and it was time to tackle Mt. Evans. 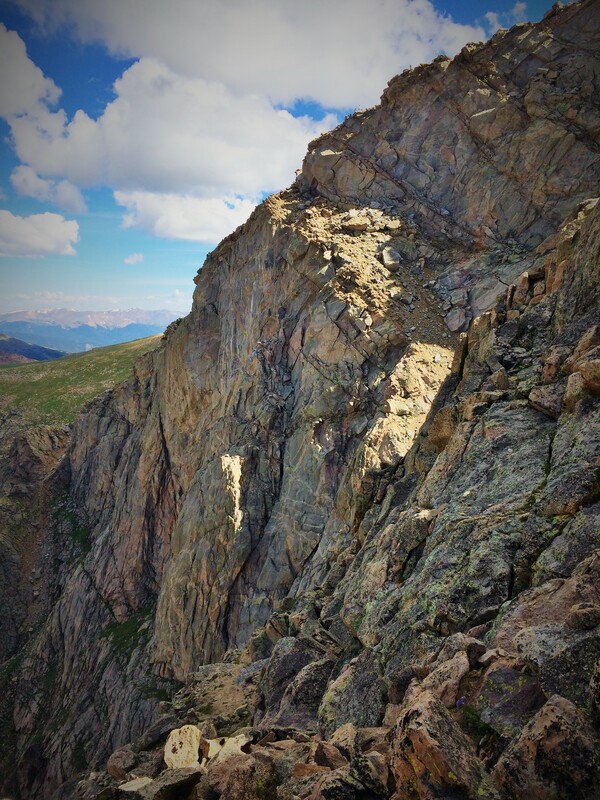 We climbed the class three up to the backside of the ridge and followed a narrow footpath along the sheer granite cliff before it wrapped around the northwest side of Mt. Evans and hit a gradual plateau. The summit was in sight. Yet, still far to go. The trail evened out for the first mile or so toward the mountain peak then turned back to a boulder scramble. My legs dragged on. But with frequent stops, to catch my breath (we’re at 13,000+ feet by now) and to rest my exhausted body, we ate away at the remaining miles. In one final corner, we turned from calm, quiet, mountain serenity, to busy tourism stop. Reaching the road that drives nearly to the top, we hopped in line with 3-year olds, international visitors, and empty-nesters to reach the survey marker and true summit of Mt. Evans. And even though, 98% of the hikers at the top didn’t go the full route from the base or our non-traditional trail, the success was still just as sweet. The top even had feeling of celebration. Popping open a can of Oskar Blues’s Old Chub, we cheered to the great hike, each other, and a 14,240 feet of pure mountain beauty. Cannot you believe you attempted to summit 2 14-ers after finishing a half marathon the day before! There didn’t seem to be much snow in your photos…did you have to hike through any patches? No snow up on Mt. Evans when I was there. Melted away for the summer, but hopefully the Rockies will get some white peaks soon! Nice job! Be careful, that 14er bug will get ya.